First finger represents the direction of the Field. 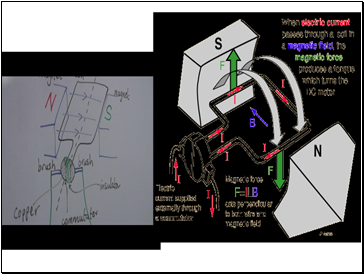 The Second finger represents the direction of the Current [conventional current, positive(+) to negative(-). The Thumb represents the direction of the Thrust or resultant Motion. FBI - moving from thumb to second finger. 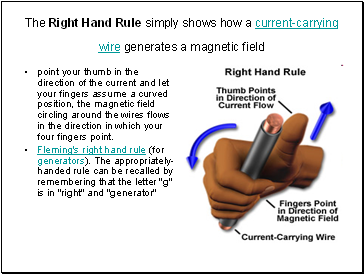 point your thumb in the direction of the current and let your fingers assume a curved position, the magnetic field circling around the wires flows in the direction in which your four fingers point. 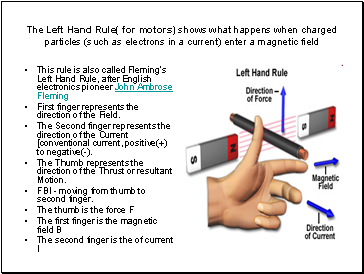 Fleming's right hand rule (for generators). 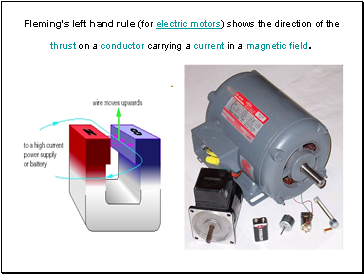 The appropriately-handed rule can be recalled by remembering that the letter "g" is in "right" and "generator"
Fleming's left hand rule (for electric motors) shows the direction of the thrust on a conductor carrying a current in a magnetic field. 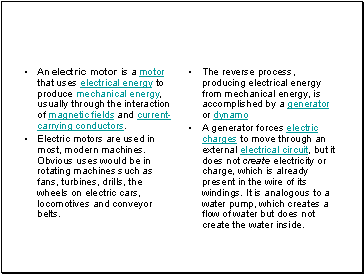 An electric motor is a motor that uses electrical energy to produce mechanical energy, usually through the interaction of magnetic fields and current-carrying conductors. Electric motors are used in most, modern machines. Obvious uses would be in rotating machines such as fans, turbines, drills, the wheels on electric cars, locomotives and conveyor belts. A generator forces electric charges to move through an external electrical circuit, but it does not create electricity or charge, which is already present in the wire of its windings. It is analogous to a water pump, which creates a flow of water but does not create the water inside.